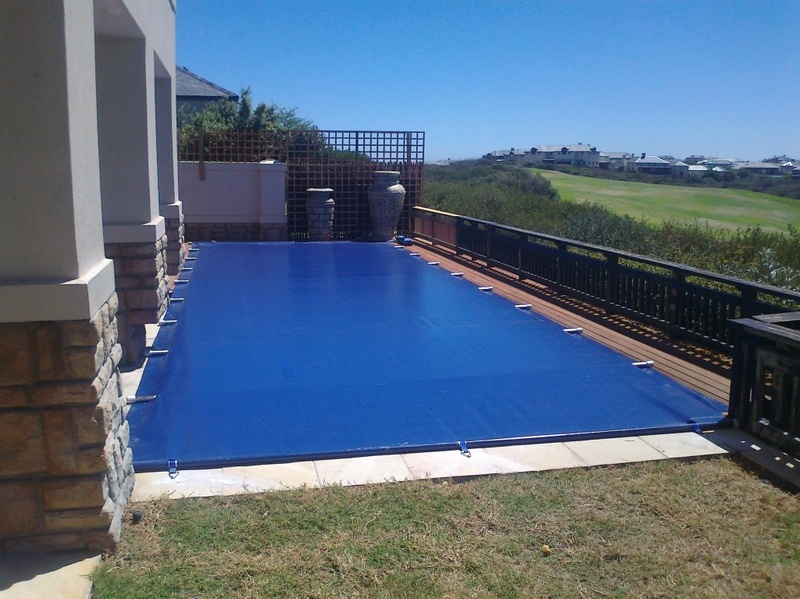 The Energy-saving Safety Cover – beat loadshedding and enjoy energy-saving and child safety benefits from a single pool cover. Until now, a pool was only considered truly energy-efficient if covered with an EnergyGuard GeoBubble cover and while the EnergyGuard GeoBubble is a stunning cover in our easy to use thermal range, it is not recommended as a way to secure the pool for children. Given the local electricity crisis and continual power cuts / loadshedding, we have designed the Energy-saving Safety Cover, a new cover which offers the best of both these bestselling covers – a 50% reduction in power consumption as well as a 225kg weight tolerance to prevent child drownings. How does the Energy-saving Safety Cover save power? The principle behind reducing a pool’s power consumption is actually quite simple. Cover the pool with a StoneGrey or Blue PowerPlastics Solid Safety Cover and light entry is stopped (light being what algae needs to grow). Leaves, debris and dust collect on the cover rather than in the water where they typically rot and alter pH, and need to be filtered out. 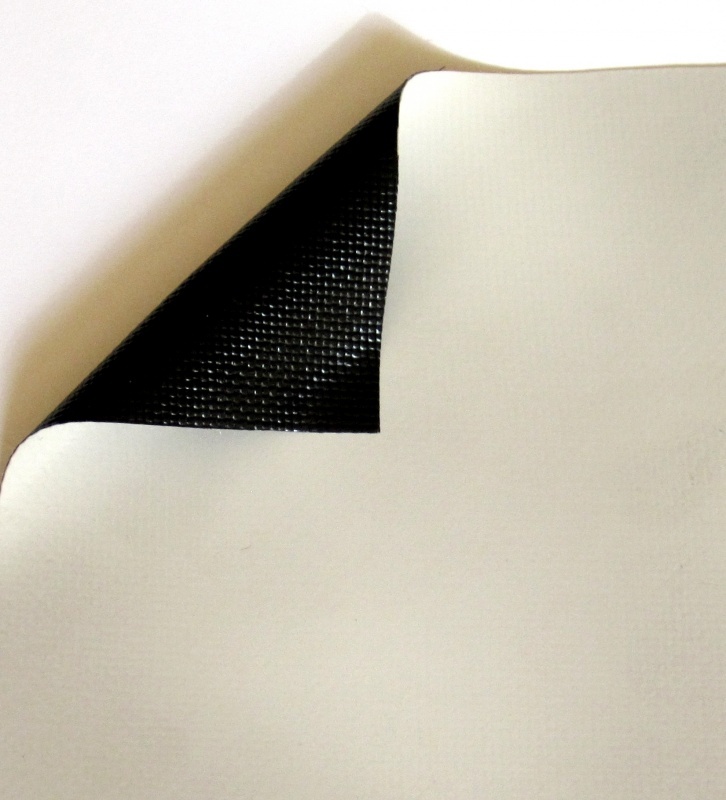 With our new Energy-saving Safety Cover, we have developed two covers which stop algae growth and therefore differentiate themselves from our other solid safety covers. This power-smart solid cover is available in Blue or StoneGrey. How does the Energy-saving Safety Cover keep children safe? This cover effectively creates a physical barrier over the water to prevent child access, conforming to international safety standards as it supports the weight of two adults and a child (225kg). 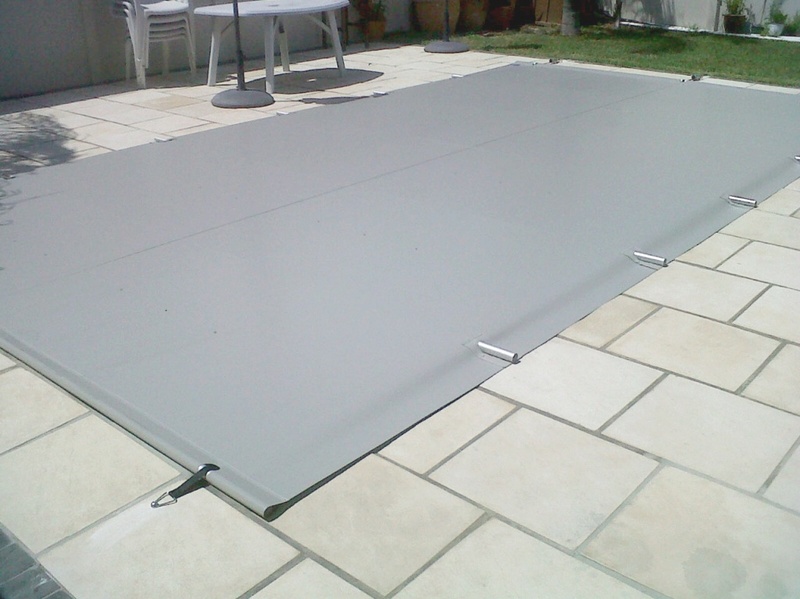 The durable solid safety cover is supported across the pool by aluminium battens that are secured into the material of the cover. A simple tamper-proof ratchet device is used to create the tension required. Reduce filtration/pump time by up to 50%: filtration is still required for aeration and eradicating minor impurities but pump time can be halved which makes for considerable power savings. The average domestic pool pump consumes 12% of the household’s total electricity. The Energy-saving Safety Cover reduces this by half. Child safety: withstands weights of up to 225kg (two adults and a child). Great for pet safety too. Reduce water evaporation by 98%+: water evaporation is reduced, curbing water loss and conserving this precious natural resource. An average pool (8m x 4m) can lose up to 38 400 litres of water if left uncovered. Remember, it requires power to pump water to your home so this also helps reduce your municipality’s load demand. Reduce chemical consumption by up to 60%: with less algae growth, less chlorine is needed with an Energy-saving Safety Cover. 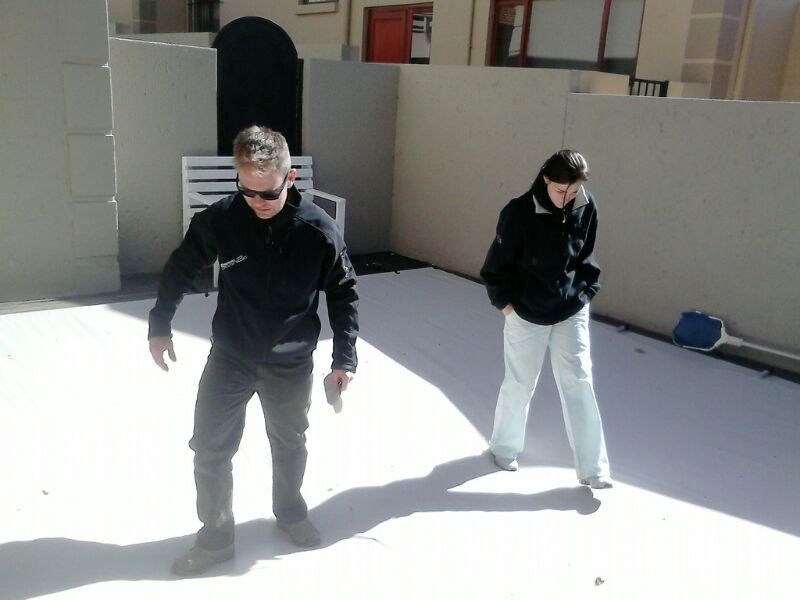 The cover also prevents chlorine from evaporating in sunlight. 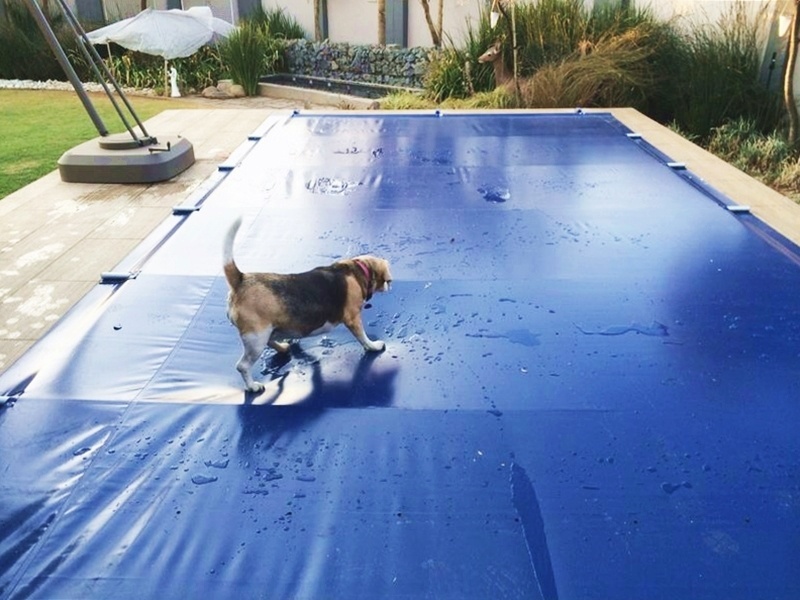 Reduce debris contamination: the Energy-saving Safety Cover cover prevents dirt, droppings and leaves from entering the water, reducing the need for filtration. Water aesthetics and hygiene are greatly improved. Hibernate the pool: can be used to put the pool away and reduce maintenance for extended periods of time. This may be when the pool is closed over winter or if you are going away for long periods or if you simply don’t want the pool anymore. Save money: by using less energy, less chemicals and less water, this cover pays for itself in 18 months. Colours: available in Blue with a Black underside, or StoneGrey with a Black underside. Simplicity of design and ease of use: supported across the pool by aluminium battens that are secured into the PowerPlastics Solid Safety Cover, one end is anchored into place with removable anchor bolts. The opposite end has corresponding ratchets which allow the cover to be tightened. Tamper-proof: the lockable strapping system makes it difficult for a small child to tamper with or attempt to release the cover. 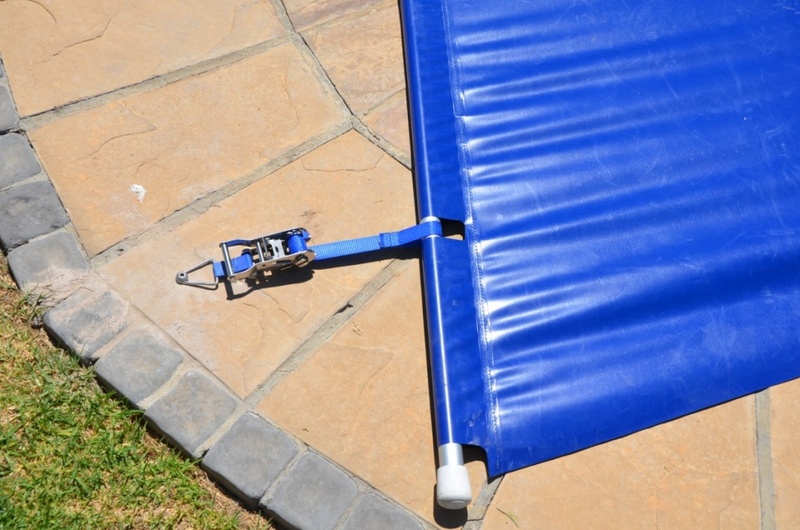 Drainage system: a common drawback with first generation or hooks and eyelet PVC covers is that rain or sprinkler water can collect on top of the pool cover, forming a small pool that curious toddlers may be tempted to play in. 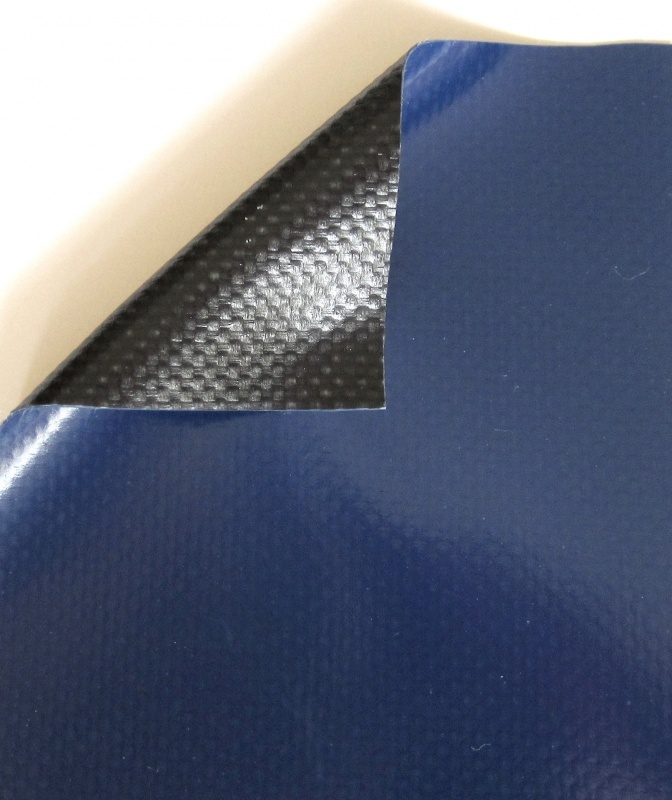 Our second generation PowerPlastics Solid Safety Cover features drainage holes to eliminate these pools forming on top of the cover. Automation options: for added convenience, the Energy-Saving Safety Cover can be semi automated with EasyRoll – a motorised Rollup Station that aids the use of larger covers.